Scout Camps – UK 2015, …Finland 2016? For 2015 we already have two camps in the programme; in February we “Camp in The Hut” and in May we will join the Loddon District “Big Camp” at Dorneywood. Our summer camp will likely be a 4-5 day trip to somewhere in the UK in late July or early August but is dependent on Scout numbers. If we don’t get to camp over the Summer holidays, we are already looking at a possible overnight camp in September. The opportunity to camp abroad, to experience a different culture, to meet other Scouts and to represent your country at an International Jamboree is a very exciting one. It is something that we have been looking to do at 1st Wargrave for some time. Our last foray overseas was to Ireland in 2009. We have been looking at what we might do in 2016 and we have an opportunity to take the boys (and maybe some girls by then too! 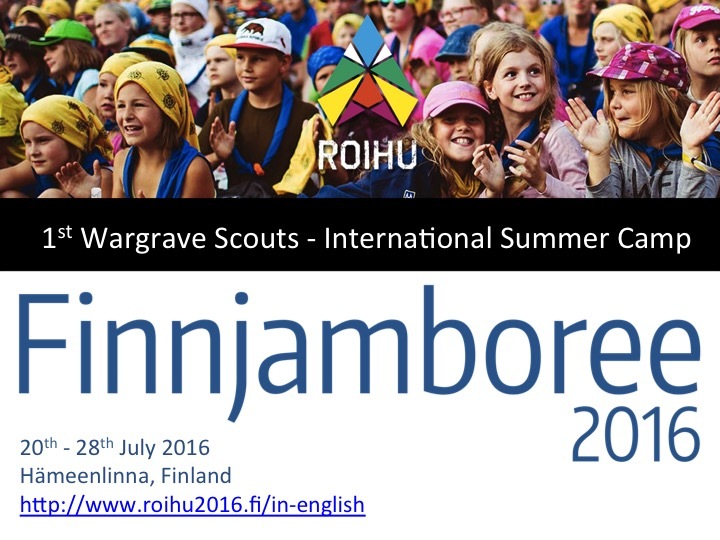 ), to an International Jamboree in Finland, in Hämeenlinna, 96km north of Helsinki. Dates are 20th July to the 28th July 2016 so just after the end of the Summer Term. We know that this will take a considerable amount of planning and commitment from the Scout leadership team to make such an International trip happen. Before we make a start, we need an idea of those that might in principle be interested to attend. This is not a firm commitment, but please don’t say yes unless you think there is a strong possibility that, if the trip is arranged, your son/daughter will sign up. Please let us know by 31st January if your son would be potentially interested in visiting Finland in 2016 with 1st Wargrave Scouts! For the latest news visit the FINLAND BLOG page.